The easiest punches to counter are the ones you know are coming. Learn to how to set traps and then punish your opponent with deadly counters. Back in my early days, I remember a time when this kid hit me with a huge left hook to my body. I thought I was smart. I said to myself, “Let him throw it again.” as I prepared to counter his next left hook. Great fighters FORCE their opponents punches! That right there is like the simple rule of success in life. You just can’t wait all day for opportunities, you have to create your own. No one is going to sit there and throw choreographed punches for you to counter. You have to do something…you have to fight! Now there’s two ways of getting your opponent to throw the punch you want…one way is to bait the counter, the other way is to force the counter. (Now I realize why my trainers always yelled at me to “GET OFF FIRST! JOHNNY, GET OFF FIRST! THROW FIRST! THROW THE FIRST SHOT! THE LAST SHOT! EVERYTHING! LET YOUR HANDS GO, JOHNNY! LET YOUR HANDS GO!!!!! !”)….the language was toned down to PG-13, btw. Why must you set a bait? The easiest punches to counter are the ones you know are coming. Setting him up, makes it easier to defend and easier to counter. Tease him with a juicy right hand opportunity and then make him pay when he goes for it. Your counter is so much deadlier when your opponent really thinks he’s countering you, but the joke is actually on him. Pretend to be lazy and then counter. Later on in the fight when you get tired, he might be too scared to take advantage. Bait with deception, not with poor positioning. The proper way to bait is to make yourself LOOK like you’re open. You’re not supposed to actually leave yourself vulnerable! Lowering your glove a few inches while leaning your head a little further away. You want to make your opponent THINK that you’re open, but reality you are just as guarded or even less open. Dropping your hands to your waist and sticking your chin straight out. This isn’t baiting, this is called “stupid”. Lower your hands a little from long distance. Make sure you’re far enough that only his jab can reach. Open up your face for his jab and trust me, he’s gonna throw the jab. It’s the basic punch everyone was taught to lead with. Make sure you’re prepared to quickly close the distance and counter. Move your head and throw a counter jab or even better, a big right cross. Or even a lunging left hook. Don’t get too wild and always follow up with more punches. Hang a lazy jab (or just hold your left glove out) and see if he goes for the right hand counter. Be ready to slip his right hand and come back with a left hook or right hand counter. Instead of throwing a lazy jab, you could also just drop your left glove. Many experienced fighters will bait the right hand by bringing their head in (JUST A LITTLE) at close range, then pull their head out and counter when you swing at it. Throw a lazy 1-2 to bait the left hook. You can also bait the left hook by walking yourself into range. Just be too close to jab and you’re bound to see the left hook. Be ready to roll under it or do something quick. Expose your mid-section at long range to bait the jab to your body. You can flex your stomach and quickly bend over to trade your big right hand for his jab to your body. If you lean away from far range (especially if you’re tall), he can’t reach anything BUT your body. You can bait body shots at close range by pulling down on your opponent’s head or shoulders. Throw a 1-2 or any combination that finishes with the right hand, and be ready for his left cross retaliation. Actually, any time you finish with any combination watch out for his left hand. Once you see that left hand, slip right and counter with a right hand to the head or body. The best way to counter punch is not to wait for the punch but to force the punch. In other words, if you want to counter his right hand, don’t wait for his right hand, but force him to throw the right hand. Instead of learning a billion counters to the jab, just work on getting him to throw the jab. Learn how to move or attack in a certain way that always baits his jab. Once you learn how to bait specific punches, the counters will come easily. If you got the energy to force the fight, then go out there and jump all over him. Hit him with everything and counter him any time he fights back. Force the punch you want him to throw and all your counters will land! NOTE: be careful what you wish for. If you’re not ready to counter, you’ll pay a price for being aggressive. Fight at long range and keep jabbing him. 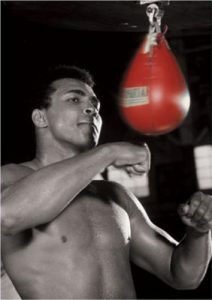 Move your head constantly like a speedbag. He’ll have to jab if he can’t reach you with anything else. Keep jabbing him. Be close enough for his right hand but too far for his left hook. Try to stick your left glove in his eye. Keep itching him with your jab and he’s going to try and scratch it with his right hand. It also helps to keep circling towards his right hand. Get closer to his right hand and smother it. See if you can get your head outside of his right shoulder (do this momentarily in the heat of the fight so he punches instead of pivoting into you). Take away the room for his right hand and he’ll be forced to throw a wide left hook to back you off. Crouching down is also another way to bait the left hook. Another way to bait the left hook is to just trade punches at close range, you’re bound to see his left hook sooner or later. The left hook is an instinctive reflex when fighting at close range. Move towards his left hand and throw a bunch of right hands at him. If you’re too far for his right hook and standing right in front of him, he’ll be forced to commit to his big cross first. Slip outside it and land your right cross. Another tip to forcing his left cross is to throw your right at his glove or at his elbow. This forces him to block first (pinning his arm) before he can counter you. One of my favorite counters is to throw a right uppercut as the southpaw’s left elbow, slip outside his counter left, and then come back with a big right to his head. Want to know the easiest way to make him throw from one arm? Just grab the other arm or smother the other arm. Stand on his right side and he throws the left. Grab his left arm and he throws the right. It’s a natural instinct. Now the smart thing is to use this knowledge to land your counters, instead of going for the easy block. Next time you know he can only throw from one side, quickly think of a way to counter it. This is what the pros do to me everytime. Just come into range and put your head one foot in front of his. I GUARANTEE YOU, that unless his hand is right in front of his chin (which it won’t be, it’s usually down by his shoulder), his punch will NOT come straight. His punch will come at an angle, making it very easy to avoid by just pulling your head STRAIGHT BACK a few inches. He misses, you counter. Easy, right? Try it in practice. Anytime that you back up away from an opponent or chase one down, try putting your head RIGHT IN FRONT of his about one foot, and then pull it straight back as he misses the angled punch. Bend your knees and squat down just a little. If he throws a downwards right, stand up and pop him with one of your own. If he throws a left hook, stand up as you uncork one of your own. He hits air, you hit him. You can be even more clever by covering with one glove to leave one side more open than the other. To bait his downwards right, use your right glove to cover his jab and left hook angles. To bait his hook, hold your right glove tight to your face. It sounds so simple but you’d be amazed at how many fighters will give up and just go for it. You can hasten his thinking by staying aggressive and pressuring him as you come in low. He won’t like the pressure and get over-anxious to keep you off. Baiting counters can save you when you’re losing a fight. By only showing certain vulnerabilities you give your opponent a predictable attack pattern so that you know exactly where to defend. 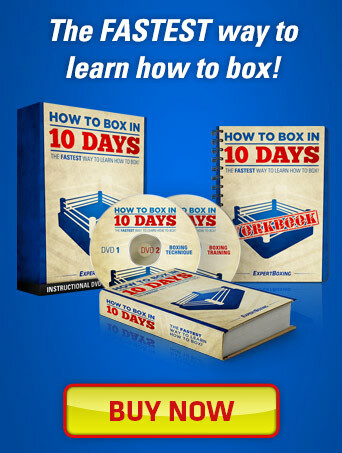 Watch some of the greatest boxers out there and study how they fight hurt. One of my favorite “losing fighters” to watch is Miguel Cotto. Watch how this guy fights in losing battles against Ricardo Torres (Round 2), Antonio Margarito, and Manny Pacquiao. Yes, he’s losing the fight but you have to admire how he does it. He’s constantly shifting his guard (his right hand) from one side to the other. He doesn’t put up his entire defense. He keeps opening his guard from one side to the other so that his opponent punches in a predictable pattern. Baiting and countering is the easiest way to beat an aggressive fighter. He’s already throwing punches, it’s what he likes to do. Don’t try to out-punch him. Be clever and get him to throw the punches you want. It’s not enough to avoid his punches, you have to control how he misses. The counter itself then becomes very easy. AGGRESSIVE counter-punchers like to match you punch for punch. If you throw a jab, expect a counter jab. If you throw a right, expect a counter right, etc and so on. Whatever punch you throw, expect the same one in return. DEFENSIVE counter-punchers like to counter from the side you just punched from. If you threw a punch with your left hand, expect a counter right from your opponent. Also vice versa, if you threw a right, expect a counter left. Instead of focusing on countering a punch, figure out how to make them throw a specific punch. so you can land the counters you want. You know you’ve got the counter-puncher beat when he doesn’t even go for the counter anymore. You might be lazy or tired but he’s no longer chasing after opportunities or trying to take advantage of your slow recovery. He’s so scared of falling for your tricks that he doesn’t realize you’re tired. Wanna know my favorite part about countering a counter? You do more damage when you counter a counter. …want to be the king of counters? Hey Johnny thanks so much for this guide man. Ive been waiting awhile for it now, and being the counter fighter i am, i find it very helpful. the only thing i dont get is why you classified offensive and defensive counterfighters the way you did. How countering with the different punch make you any more aggressive or defensive? @Mac – sorry for the confusion. I mentioned the difference between aggressive and defensive counter-punchers as a general idea. The aggressive counter-puncher will like to punch right when you punch, leading to a race of your punches. A defensive counter-puncher will wait to block or defend your punch first before attacking your weak side (the side you punched from). It’s not a set rule or anything but I tried to give a little insight into the minds of different counter-punchers. Thanks for another great article j. 3.When he is coming for an punch (Most effective cause with all power he is coming to kiss the punch) In this counter i guess “slip” only must be used cause blocking (with going forward) reduce the power by stopping the opponent come to you. Correct me if im wrong or not complete bro, these are just my thoughts. @Radd – there are so many opportunities to counter that I couldn’t just narrow it down to 3. The timing, the angle, the way that you evade during the counter. Here are some examples…but in reality, you can counter anyway you want. 2. striking at the same time or as the punch is coming – is probably the most painful an easiest way to surprise him, shock him, or exploit his openings. I never think too much about where his arm is during its punch trajectory….UNLESS, the arm is in the way of my punch. In which case, I have to factor his arm trajectory into the timing of my counter. The general idea is that a counter punch is always effective, regardless of where his arm is. @Radd – very funny video! Great article but I have trouble understanding the ‘combo baiting’ ..could you explain that more? I jus watched cotto and torres 2nd round and it was an interesting round but couldn’t figure out what you were talking about. Thanks! @Lou – Watch the cotto vs margarito fight when he was losing. Watch how he keeps re-angling himself and shifting his glove to keep punches from landing too clean. In some cases Margarito is just throwing non-stop cuz that’s what he does. But in other cases, Margarito is only throwing at what Cotto is giving him. And so you see Cotto giving the opportunity and then taking it away. Then giving it another, and also taking that away. I have a friend who has very powerful and quick right jab. With his fast footwork and always move to my left handside. This is very difficult to counter him w.th my right hand how to smother his jab and force him to use big right so i can counter him? @David Leung – spread your feet a little and walk to his left as he walks to yours, see if that opens up any opportunities (as opposed to trying to fight him from your side). Anybody can be a counter-puncher…regardless of size. To beat those tall guys, try slipping towards his right elbow and bomb him with many overhand rights followed by left uppercuts to the body or head. @dayne – that article is coming soon! Dont get me wrong, its excellent written as always, but due to so many punches & the lack of sparring experience, i can’t visualize what you’re talking about, or what should i do in each case. If possible, could you please add some videos? I know there are many different cases, but please try at least for the basic/simplest ones. Thanks in advance! @spyrosk – the article is really a theoretical one more than a technique one. But the general idea is that you want to make your opponent throw a specific punch first, and then you counter that. Which is better than waiting around all day and then trying to counter a random punch from your opponent. coach, this the best article on the site man. its not complete, but can u imagine a single book being able to cover all counter and bait tactics in boxing, forget 1 article ? i think its not quite as attractive to your viewers because 1. its a ******* complex and advanced topic and bravo for putting that up 2. theres none of your awesome explanation pics or a video! people wanna see johny lee beating up some poor fool sweet science style. its such an excellent topic, i urge u to make it easier to understand coach. 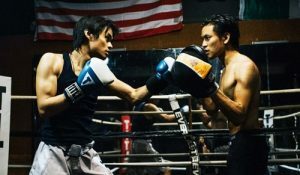 im sure if u added some pictures to explain it for people, use videos it would be the most useful article to newbie boxers. in fact, i think to show the subtleties absolutely needs video. drawing out a right with a little angle, putting the lead glove down after throwing your jab just a little to entice a shot, isnt it hard to imagine without seeing it ? im just picturing how hard it would be to make such a tutorial, so the trap looks real and not a gaping hole by putting the hand down too far. getting someone to throw a shot by changing height, i think if a vid shows a guy bending or rising up suddenly the viewers will automatically get that instinct to throw a punch at the screen. and the article will become easy to understand. Saber, I’m really glad you enjoyed this because there’s a lot of gold in this one. I wanted to keep this just a theory article because the small details will be expanded into full guides with pictures and videos. For now, I just want to get everyone thinking on a more advanced level. In due time, my friend. I was thinking that sometimes people will have their hands down because they want you to hit them in the face. But what about a right feint to the face and a hook or uppercut to the body? Good idea or bad idea johnny? Good idea, J. Try it. “You can bait body shots at close range by pulling down on your opponent’s head or shoulders.” Do you mean pulling down literally? wont i leave myself vulnerable? Yes, put your hand on your opponent’s head or shoulders and put downwards force. Yes, you’re technically “open” but that’s what baiting is. You leave yourself open (but fully aware) to make him go for the punch, and then you counter. what would be your top five combo’s for baites to the body? 4. Coming into close range baits many hooks. 5. Doing the Mayweather shoulder roll defense will bait many right hooks to the body. Whos ur favorite boxer johnny? That’s a tough call. I like so many. I’m a big fan of Pernell Whitaker, James Toney, Roberto Duran, I could go on all day. whats the difference between james toneys style and Mayweathers? They’re totally different fighters Jason. Toney has more shoulder roll and more slipping. Mayweather is more offensive and counters faster. Mayweather also likes to clinch and grab a bit more on the inside. Their offensive weapons of choice are entirely different. 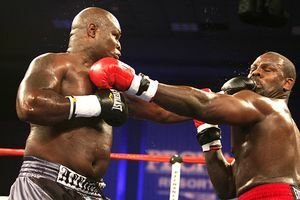 James Toney has more of a flow and Mayweather likes to use one or two punches at a time. There are many differences. Your biceps hurt first or get tired first? It might be the way that you throw your hooks. That’s not a bad idea Arthur. If you tell me your favorite articles, I can rewrite a condensed version for beginning southpaws! That’s a great idea, Blake. This article was really more as a theoretical guide but later I will show some exact demonstrations of how to bait and force some common counters. Hey johnny i was wondering i heard stories of blood clots and stuff wen boxers get hurt sometimes…Are the chances high of receiving such a severe injure such as blood clots? It’s a serious injury that can happen to anybody, not just boxers. Some people are more susceptible to this injury than others. I recommend that you be safe and fight within your limits! Do you have any tips for an aggressive in fighter? may i get you opinion johnny? I guess you could say taunting is a psychological form of baiting. Baiting is being deceptive (and requires skills) whereas taunting is being disrespectful. Both are entirely different things but both of those are methods of getting your opponent to attack you. I’ve never been taunted by anybody that was worse than me. The last guy that taunted me was maybe 7 years ago and he was an olympic alternate and former sparring partner of Pacquiao. There was nothing I could do to him…he was better than me in every way and he made sure I knew it. What I did was completely close up and fought out of a super-tight defense for 20 minutes (we weren’t taking any breaks). At some point he got through my defense and drew blood off my lip. I think I earned his respect because he finally realized I wasn’t backing down and so he stopped the match himself. In the boxing community, you’re not supposed to taunt. Nobody likes that kind of person and if you get known for that, everyone in the gym will hit you extra hard and you won’t know why. Forget what you see on TV, boxing is all about respect. You won’t last long in the game without it. understand that watching more video of boxing matches between great fighter would improve the technique and strategy, can you recommend any best fighters video that we should watch? Im 17 and 170lbs, box most days and Im usually sparring guys better than me or bigger. there is a guy i used to spar alot but i hardly spar at all now, he is same height and same arm reach but 40lbs lighter than me, he is a fighter who loves to dance around on his feet, i find myself chasing him round the ring because he never stays still, he cant get any good punches on me but i also can hardly catch him with shots, he dosent throw many punches either, he just throws loads of left jabs, i have tried slipping under his jab to get to him but he jumps back immediatly, have you got any tips or ways i can get close to him and still be boxing as apose to bullying him into the corner and unloading? Sounds like you need better footwork and better reflexes. Start jumping rope. Also work on hitting and slipping the mitts with a completely relaxed body. If you have to tense up, it slows you down and tires you out faster. how do i bait a guy thats a counter puncher? or doesnt jab and waits for me to come in? is there where forcing the counter comes in? Well yes…feint a jab…or force the counter. Yes, you’ve read the tricks. Now give them a try. I’ve also written a guide on “how to fight a counter puncher”. As a southpaw, you can bait the orthodox left hook getting your head close to him. Make sure you pull out your head or weave under when the hook comes! Thanx for putting out all of these great articles for us aspiring boxers lol this website is my homepage on my phones internet. But I was woundering would baiting and forcing the orthodox left hook or left hook to the body change any for us southpaws and would any stratigies for baiting any other punches change due to the angles. And what about uppercuts? The orthodox left hook does give you tons of countering opportunities. Pull away and come back with a counter left (to the head or body). Johnny! I want to know how to do this from the peakaboo stance as an aggressive pressure fighter. What you’re describing is for boxers with a long and steady rhythm. I have an explosive rhythm with the peakaboo. How could I apply this? I’m the type of guy who’d like you to be taught the mindset and break these down step by step so I can create my own baits. Every opponent is different, so it’s important that I can make my own based on feeling them out, like feinting. Instead of feinting with punches, trying feinting more with head movements. In my opinion, peek-a-boo fighters will benefit a lot from baiting the bigger punches so they can counter with the bigger counters.